When looking to rejuvenate the face, many patients often seek a chemical peel to treat facial impurities, such as wrinkles, acne scars, sun damage, and fine lines. A chemical peel is a non-invasive treatment that uses specific chemical formulations that are brushed onto your face to address and remove the damaged outer layer of the skin. While chemical peels are a great way to restore tone and texture to your face, knowing which type of peel will best benefit your skin can play a huge role when undergoing treatment. Here are just a few chemical peel treatments that will address your facial concerns and provide you with young, healthy-looking skin. Trichloroacetic acid peels, or TCA, is a medium chemical peel and known as being one of the most frequently requested peels by many patients. It uses a trichloroacetic acid that, when applied to the skin, will cause the top layer of your cells to dry up and peel off within a few days. After the solution has been removed from your face, it will leave a new, smooth layer of skin. Phenol chemical peels, or a deep chemical peel, use a strong chemical formulation to treat severe facial impurities. Because of the type of solution used, phenol chemical peels may require local anesthesia or a sedative to provide patients with comfort during their treatment. This treatment is also more intense than a TCA peel and recovery can last up to one month. Glycolic acid peels range from mild to moderate and can penetrate the deepest parts of the skin. It is great for exfoliating and rejuvenating the outer layer of dead skin cells, and it works deep in the tissue layer. While glycolic acid peels can address several facial impurities, it may have drastic side effects for those with extremely sensitive skin. Lactic acid peels are light chemical peels derived from milk and used on patients who have slightly sensitive or dry skin. It can also be used on patients who are undergoing a chemical peel for the first time. Because of lactic acid’s mild and natural substance, it will not cause redness in the face. Each chemical peel uses specific formulas to brighten and rejuvenate the skin, making you look and feel younger. Chemical peels can also improve the tone and texture of your skin. The condition of your skin will determine the type of peel you need. Lactic Acid Peel: Lactic acid peels are derived from milk. They can address mild facial imperfections like wrinkles and fine lines, while also removing dead skin cells and debris. They can also brighten and lighten the skin to give patients a more youthful appearance. Glycolic Acid Peel: This chemical peel is best suited for patients who suffer from complexion irregularities or active acne breakouts. It targets problem areas on the face and neck by removing the layers of skin where breakouts caused by dirt, bacteria, and dead skin cells are occurring. Glycolic acid peels can also treat blackheads, sun damage, and other symptoms of aging. What Is the Best Skin Peeling Treatment for Me? Now that you have read about all the different kinds of chemical peel treatments and the benefits of each, knowing which method will best suit your skin type is another important factor to consider. Some patients have dull, dry skin that is in need of brightening and hydration. However, certain treatments can cause sensitive skin to break out or have an allergic reaction. Lactic acid peels are the perfect choice for patients who are in need of a gentler treatment option or who have darker skin. Patients with thicker skin who wish to rejuvenate their tired and aging appearance should opt for a more moderate chemical peel to treat imperfections and pigment irregularities. Glycolic acid peels come in various strengths to exfoliate the skin, which helps to make a person look and feel younger. They can also treat dry and dehydrated skin. If a patient’s skin has been severely damaged and requires treatment below the surface, they may want to consider a more intensive chemical peel treatment. 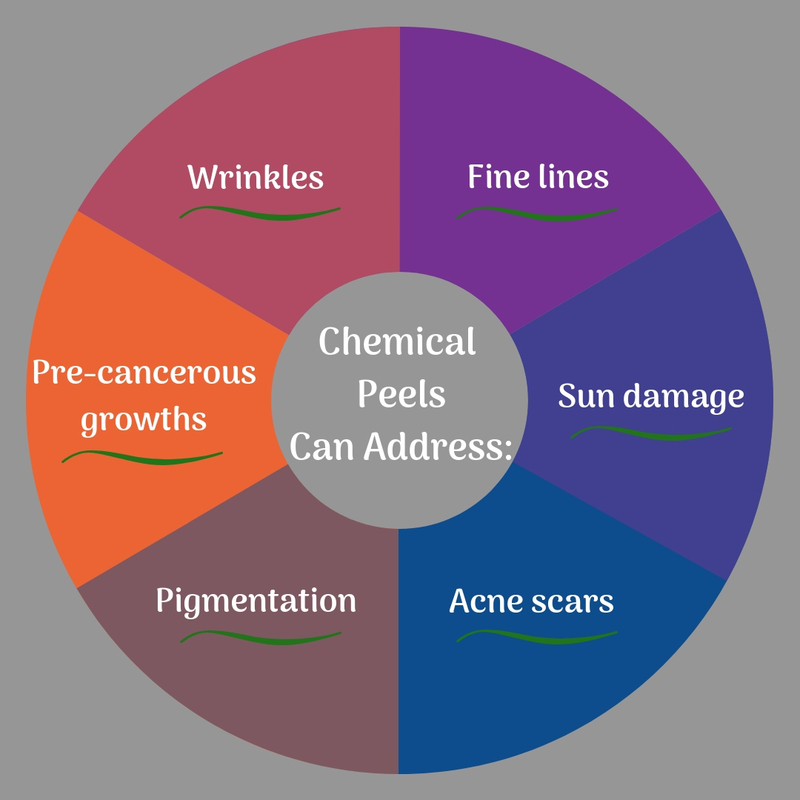 TCA and phenol chemical peels can penetrate to the middle layer of a patient’s skin to remove damaged cells. Once you have determined the best chemical peel treatment plan for your skin, you will be amazed by how smooth and refreshed your facial appearance will be following your treatment. You can expect long-lasting results that will make your skin look and feel great. Make sure to avoid direct exposure to sunlight and use plenty of sunscreen to protect your rejuvenated skin. For more information regarding chemical peels and which treatment would best suit your facial needs, schedule a consultation with Dr. O’Neil online or call our practice at (951) 296-1690.